LOT Publications Webshop. 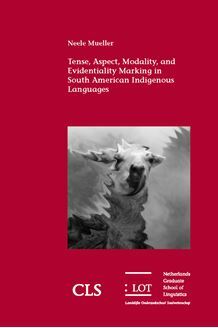 Tense, Aspect, Modality, and Evidentiality Marking in South American. This study presents an analysis of morpho - syntactic tense , aspect , modality , and evidentiality ( TAME ) marking in a sample of 63 South American indigenous languages ( SAILs ) with regard to typological , geographical , and genealogical distributions . It aims to provide an overview over the occurrence of selected TAME features in South America and seeks to uncover possible patterns that add to our understanding of the distribution of these SAILs . The basis for the analysis is a questionnaire designed i ) to capture the major TAME features and ii ) to take into account several features of particular interest in South America . The following features are investigated : future , past , present , remoteness degrees in future and past , realis , irrealis , forms of command marking ( imperative ) , intentional , potential , certainty / uncertainty , dubitative , frustrative , purposive , desiderative , perfective , imperfective , anterior , habitual , continuative , iterative , completive , incompletive , firsthand , non - firsthand , secondhand , quotative , visual , inferred , and assumed . Taken into account are overt morpho - syntactic markers , such as affixes , clitics , and particles . The language sample was designed to balance geographical and genealogical diversity of SAILS with a focus on certain families and regions , taking the availability of good descriptions into account . The sample represents 25 languages families in addition to 11 unclassified languages . To summarize , results show that the distribution of TAME in the sample is highly heterogeneous in all respects . Exceptions include some language families ( e.g . Quechuan ) and a few geographical patterns ( e.g . of FRUSTRATIVE ) . It is argued that possibly the relative instability of TAME is the reason for this .